Hockey India on Friday named 48 players for the 22-day National Camp to commence on May 28 at the Sports Authority of India, Bengaluru. After a gruelling three-week national camp that focused on individual player-assessment and improvement, the 48 players who have been selected from a larger pool of 55 men in the previous camp will work under Chief Coach Harendra Singh ahead of the FIH Men’s Champions Trophy in Breda, the Netherlands. “In the previous camp, we focused a lot on individual players’ skill set to ensure fewer errors. A lot of attention was also on goal scoring and PC defending,” stated Chief Coach Harendra Singh. The present National Campers list includes six goalkeepers in PR Sreejesh, Suraj Karkera, Krishan Bahadur Pathak, Vikas Dahiya, Jagdeep Dayal and Prashant Kumar Chauhan . Hockey India has named 14 defenders in the group of 48 which includes dragflickers Harmanpreet Singh, Rupinder Pal Singh, Varun Kumar, Amit Rohidas, Dipsan Tirkey, Gurjinder Singh apart from Gurinder Singh, Kothajit Singh Khadangbam, Surender Kumar, Birendra Lakra, Nilam Sanjeep Xess, Jarmanpreet Singh, Amit Gowda and Anand Lakra. Midfielders Manpreet Singh, Chinglensana Singh Kangujam, Sumit, Simranjit Singh, Nilakanta Sharma, Sardar Singh, Hardik Singh, Lalit Kumar Upadhyay, Raj Kumar Pal, Amon Mirash Tirkey, Dharminder Singh, Manpreet Jr and Vivek Sagar Prasad have been called up for the camp. Forwards S V Sunil, Akashdeep Singh, Gurjant Singh, Mandeep Singh, Ramandeep Singh, Dilpreet Singh, Sumit Kumar, Mohd. 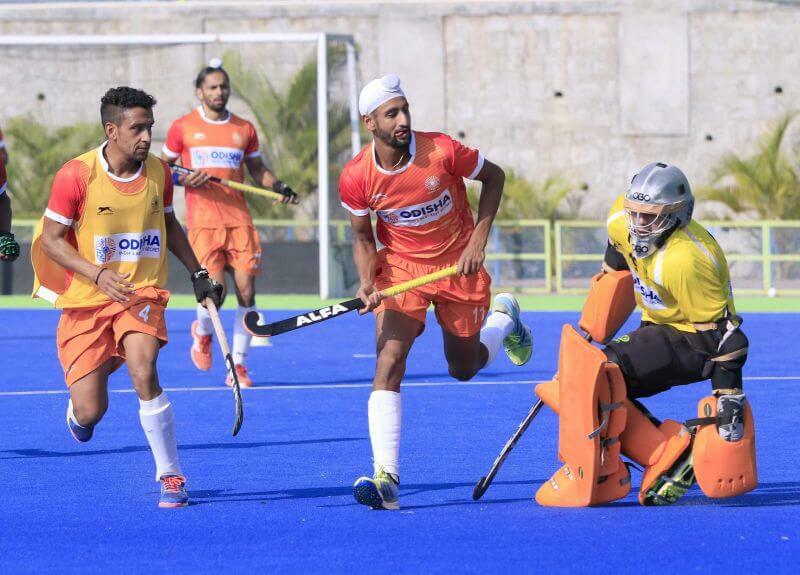 Umar, Abharan Sudev Belimagga, Mohammed Raheel Mouseen, Armaan Qureshi, Sukhjeet Singh, Gagandeep Singh Sr, Pardeep Singh and Maninderjit Singh have been included in the National Camp. “I believe we have a very strong pool of players to choose from for the Champions Trophy to be held in Breda. Since this is the last edition of the prestigious event, there is no doubt we want to be part of history by standing on the podium. That is what our focus will be on as we begin the National Camp,” expressed Harendra Singh.